Family dynamics are often affected when a family member is diagnosed with dementia. Dad might no longer be able to make big decisions. Mom seems to get lost in the middle of an important conversation. As a result, family members may find themselves taking on new roles. And not everyone is comfortable with this. 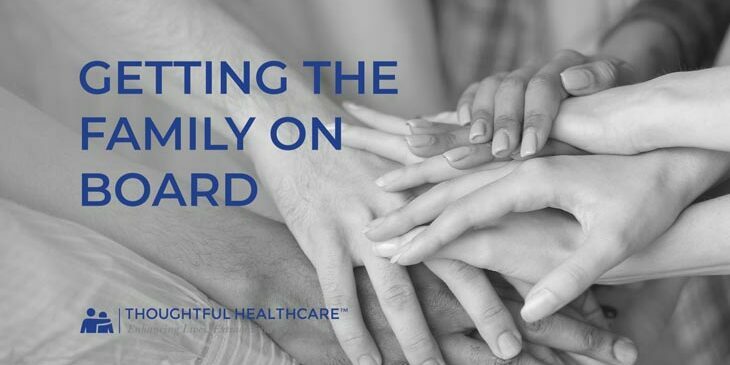 For many years, Tim Tholen, CEO and Founder of Thoughtful Health Care and its affiliates in Kansas City has seen these family dynamic changes among his clients. In the “Getting the Family Onboard” video, Tim helps clarify and address some of these issues in order to help families see the big picture. Begin by making action lists. A shared online document is a good way to keep everyone up to date. Keeping the end goal in mind will help every member of the family stay focused on outcomes. Remember: the care and wellbeing of the loved one with dementia is that end goal. Delegate: geographical location and the ability to get things done are good indicators of who should do what. Lose the drama–everyone is human and is doing their best. Having a family member deny that the family dynamic has changed is frustrating, but it serves a purpose. Some people are so uncomfortable with major life changes that they feel safer denying that anything is wrong. Being in a state of denial is a coping mechanism for some people, and it’s fairly common in families who are faced with the challenges that dementia brings. Try to treat this person with compassion, but don’t expect that he or she will be able to contribute to decision making. Remember that everyone has his or her own emotional timeline, and some people are simply better planners and executors than others. Our professional caregivers at Kansas City Home Care are here to support your family in caring for a loved one at home. Please feel free to contact us for more information.